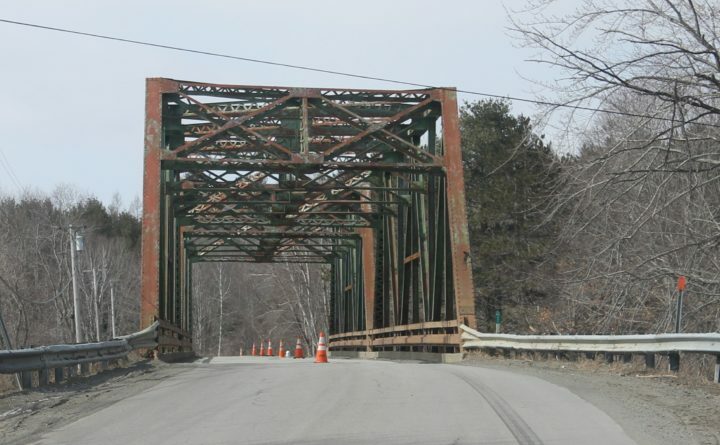 The Maine Department of Transportation is looking to replace the 82-year-old Pleasant River Bridge on outer Pleasant Street in Milo in several years. The bridge is one of three in Piscataquis and Penobscot counties that will be replaced and/or rehabbed using a $10.8 million federal TIGER grant awarded last month. In 1936, the United States was in the midst of the Great Depression, President Franklin Roosevelt was elected to a second term, and Jesse Owens earned four gold medals at the Berlin Olympics. It was also the same year that the Pleasant River Bridge in Milo was built. On a cold and windy day earlier this month, I toured the Pleasant River Bridge with Maine Department of Transportation Commissioner David Bernhardt and Milo Town Manager Damien Pickel. The bridge is now 82 years old, rusted, too narrow and well past its original design life. Together, we saw firsthand how time, the elements and collision damage have taken a severe physical toll on this bridge. In addition to being structurally deficient, the Pleasant River Bridge is classified as “fracture critical,” which means that if one steel member in tension fails, a portion of the bridge, or even the entire bridge, could collapse. The Pleasant River Bridge is one of three aged and dilapidated bridges in Penobscot and Piscataquis counties that have been prioritized for replacement by the Maine Department of Transportation. The other two bridges are Mattawamkeag Bridge on Route 2 and the West Branch Bridge on Route 11. These critical infrastructure projects were unable to move forward, however, without sufficient funding. But that changed with the help of the $10.8 million federal grant the Maine Department of Transportation and I secured last month, which will cover half the cost of these crucial projects. The state of Maine will provide the remainder of the funding. This grant will allow these bridges to be replaced before they have to be posted, causing trucks to make costly detours. The Maine Department of Transportation calculated that, without these bridges, detours would add from 12 to nearly 100 miles to one-way trips — 100 miles. These detours would have had serious and damaging consequences for Mainers and Maine businesses. It was imperative that we acted to ensure that these transportation arteries remained open so local residents could reach their homes, workplaces and health care. These bridges are also essential to preserving visitors’ access to the region and enabling the products of Maine businesses to reach the market. As Commissioner Bernhardt noted, for the forest industry, transportation is probably 30 percent of the cost of doing business. Anything we can do to help them and get the bridges in shape is really good for the economy. It’s really good for the state. As the chair of the Senate Transportation Appropriations Subcommittee, one of my highest priorities has been to improve our nation’s infrastructure and to ensure that Maine’s needs are addressed. That is why I have strongly supported the Transportation Investment Generating Economic Recovery (TIGER) grant program, which provides targeted investments for states to improve infrastructure. Last year, this highly competitive grant program received 452 applications requesting a total of more than $6 billion. Only 41 projects — less than 10 percent — were selected. Since TIGER’s inception in 2009, I have worked to secure more than $133 million for critical transportation investments throughout Maine. Maine TIGER applications have been successful in every funding round. In my travels throughout Maine, I’ve seen firsthand the positive effects of investing in our roads, bridges, railroads and seaports to improve safety, boost our economy and create and sustain much-needed jobs. Among the Maine projects that have received TIGER funding are the replacement of bridges in Kittery, Dresden-Richmond and Rumford, the breakwater in Eastport, and improvements to all three of Maine’s major ports in Portland, Searsport and Eastport. A TIGER grant also helped save freight rail service in northern Maine. TIGER has made a significant difference in our state, providing funding for vital projects across Maine that might otherwise never have been built. These infrastructure improvements support families and communities. The bridge replacements in Penobscot and Piscataquis counties are a prime example of how investments through TIGER pay dividends for the region and the entire state. Construction is expected to begin next year, and key improvements include wider lanes to accommodate trucks traveling across the bridges in both directions. These new bridges will be built to last and designed to carry traffic for the next century. Working with our state, communities and the private sector, I will continue to advocate for responsible investments to improve Maine’s transportation infrastructure. Susan Collins represents Maine in the U.S. Senate.